The Bentley Bentayga offers exactly one powertrain in the US: a 6.0 liter W12 with 600 horsepower and 664 pound-feet of torque. Overseas buyers get the additional option of a 4.0 liter diesel V8 with 429 hp and 664 lb-ft – the same oil burner from the Audi SQ7, denied us after Volkswagen Group pulled diesels from the US market. Auto Motor und Sport reports that Bentley will add two more powertrains to the mix over the next year, but it’s unclear whether any of them will come here: a 4.0-liter gasoline V8, and a plug-in hybrid. The German publication expects the Porsche-developed 4.0-liter, twin-turbo V8 to get the nod for Bentley use. That engine serves in the Porsche Cayenne Turbo (550 hp/567 lb-ft) and Lamborghini Urus (650 hp/627 lb-ft), which both share their MLB platform with the Bentayga. Making sure not to step on the toes of the W12, the 4.0-liter petrol V8 will get something like the Cayenne Turbo’s 550 hp. We’ve seen spy shots of the Bentayga PHEV testing at the Nürburgring, but we weren’t sure what the SUV used for motivation. Porsche again donates equipment for the plug-in hybrid Bentayga, the forthcoming powertrain swiped from the Panamera 4 E-Hybrid. In the Porsche, total output comes to 462 hp and 516 lb-ft. Spy shooters captured a photo of an “EV Mode” button inside the Bentayga, so we know it will do silent running; the 14.1 kWh battery in the Panamera E-Hybrid provides 31 miles of electric-only range. 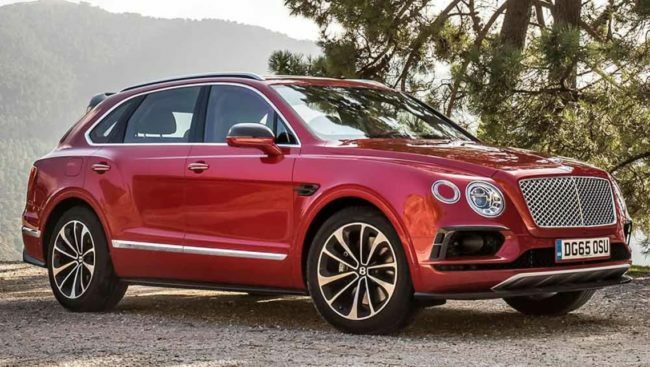 Both powertrains will provide a lower price point for the Bentayga compared to the W12, a stat line that should increase the big Bentley’s appeal even though sales already qualify as gangbusters, considering the vehicle. According to AMS, the 4.0-liter gas V8 Bentayga should show up sometime around summer 2018, the PHEV to follow.